On the first day of this year, after the wettest year on record last year, it was time to bring a few of the other root crops up for air from the sinking sand and claggy clay that they've been growing in. 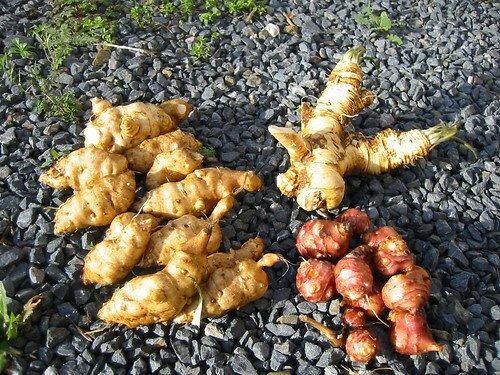 We have two sorts of Jerusalem artichokes here, both commercial varieties bought in from supermarkets. The smaller red ones are the oldest and they haven't enjoyed the wet very much at all. Normally they are much larger and more knobbly but the plants are weak growers and need good conditions. I've never seen this sort flower. The long white ones are another more modern variety, I think Waitrose told me they were grown in Lincolnshire but didn't provide a varietal name. I'd guess they were some selection of the old Fuseau type. These are more vigorous and do flower rather attractively in late autumn although I've never seen seed set. Since I'm not trying to breed new strains it's of little importance; to be brutally honest we eat very few of the ones we grow now from fear of the gaseous consequences of poorly digested polysaccharides despite the many health benefits attributed to them. The big chunk of horseradish was something of a bonus, the wet earth meant it yielded more easily to the spade and made excellent relish for the salad lunch of abstemious January.